CircusTM 2.0 IRC is an ever-changing effect light with flowing, razor-sharp beams and a ring of punchy white LEDs optimized for strobe effects. Five separate, synchronized pods create bold effects both in the air and onto any surface. Red, green, blue, white and amber LEDs provide a multitude of colors to achieve any look. For easy access to the automated programs, use the optional IRC remote to take command of the fixture. 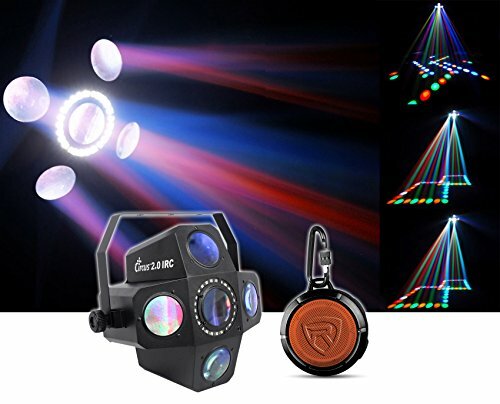 Package Includes : Chauvet DJ Circus 2.0 IRC LED Effect Light With Strobe Effect - Sound Activate or DMX Controlled or IRC Remote Controlled + Rockville RPB1 10 Watt Waterproof, Portable, Handheld Bluetooth Speaker, Loud! Chauvet Circus 2.0 IRC LED FX and Strobe Light. LED effect light with sharp, flowing beams and high-impact strobe effect. Convenient, wireless non-DMX control using the optional IRC remote. Achieve intensity and toughness with road-ready SMD LEDs. Light punches through the air as it projects from pod to pod with automated programs . Maximize color options with red, green, blue, white and amber LEDs. Save time running cables and extension cords by power linking multiple units. Increase control options using automated and sound-activated programs, or master/slave and DMX mode. Fits best in the CHS-50 VIP Gear Bag.